A small coastal town on the west side of Yorke Peninsula, Balgowan is now popular with the locals, campers, tourists and fishermen alike, very much different to the bagged grain and shipping days of years ago. Named in 1876, Balgowan was planned as the Hundred of Kilkerran’s town and shipping outlet. Allotments and streets were surveyed, along with provision for a school and cemetery. The need for shipping facilities for the import of goods and export of agriculture commodities like grain were of a high priority. While the town of Balgowan never really developed as first planned, the port became an important grain outlet, but not before the blunders and poor planning by Government had been rectified. Lobbying and deputations by the local grain growers in 1880 finally saw the Government agree to build a jetty at Balgowan. The farmer’s joy and jubilation turned to anger and frustration when the site of the proposed jetty was known. A small, low and inadequate jetty was built west of Point Warrene, surrounded by reefs and shallow water, preventing access by the coastal vessels. So unsatisfactory was the location of the jetty, not one bag of grain was shipped over it. 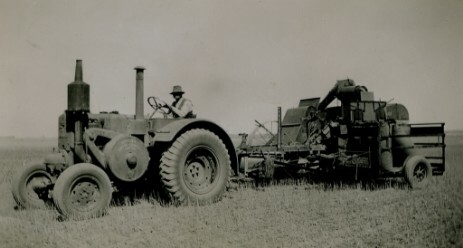 Farmers had no choice but to continue carting their grain by horse teams and wagons to the distant stacking sites of Moonta and Port Victoria. Another twenty five years passed before a more suitable jetty was built in 1907 (near the present day breakwater). While not built to plan, this jetty at least allowed the movement of the farmer’s bagged grain and other produce like chaff. Farm machinery, fertilizer, building materials etc were landed at the jetty. 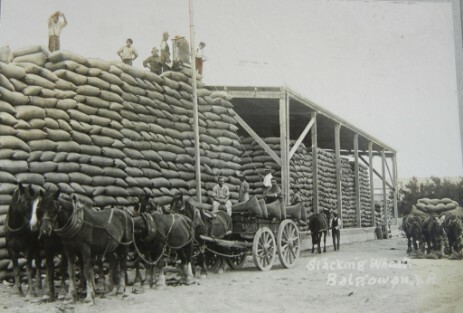 For the next forty years, the district’s bagged grain was shipped from the small port of Balgowan to the overseas ships loading off Port Victoria, Wallaroo and Port Adelaide. A large tonnage of malting barley was shipped to the maltsters in Melbourne. Balgowan never reached its true potential because of poor planning and the jetty not reaching into deeper water. 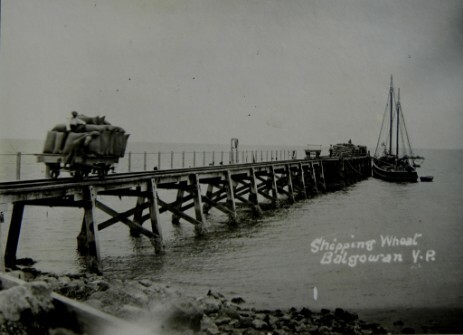 Many of the ship owners and their captains were reluctant to load at Balgowan because of the dangers from the surrounding reefs and the exposed location of the jetty. Shipping activities ceased in the late 1940s and the jetty gradually fell into disrepair. Often damaged by winter storms, the outer end and the loading berths were removed in 1967. The remaining part of the jetty was destroyed in 1981 during a record high tide accompanied by gale force winds. Stuart has written a fantatsic book detailing the history of Balgowan. To purchase a copy click here for more info.